Happy Bloggers Challenge Friday! Thanks to those who played along with last weeks Quotes Challenge, this weeks challenge is Friendship. I created my card using Bo Bunny pattern paper, stamps from Verses Rubber Stamps and Our Daily Bread Designs, along with Dies from Spellbinders, Top Dog Dies and My Favorite Things. The sentiment is from Verses Rubber Stamps (It's a Hug), stamped in Black Archival on White card stock, then die cut using Spellbinders Circle Dies, and layered on a Black circle panel. I die cut the doily using the large doily from Top Dog Dies Cherish Doilies & Tags Die Set (TC027) from White card stock, the Fish Tale Dies are from My Favorite Things, die cut from Black card stock and Bo Bunny pattern paper. To embellish my card, I added flowers from Prima and Zva Creative, die cut flourishes and leaves from Pistachio card stock using Top Dog Dies Leafy Flourishes Die Set (TC016) and Purse Card Finishers Die Set (TC002), and stamped butterflies using Our Daily Bread Designs Faith stamp set. So pretty, Lisa! I love the doily framing the sentiment panel. Who wouldn't want to receive this card. It's so pretty and the sentiment is so sweet. 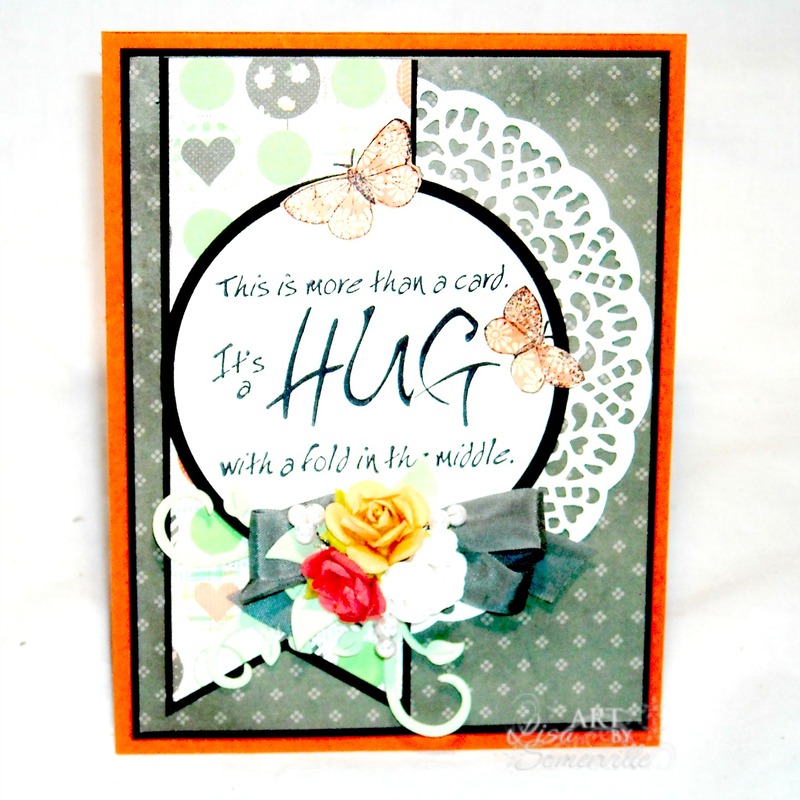 Love your hug card! Feels so good to play, better late than never GF.